Huge market potential: three-fourths of Germany’s commercial vehicles are vans. 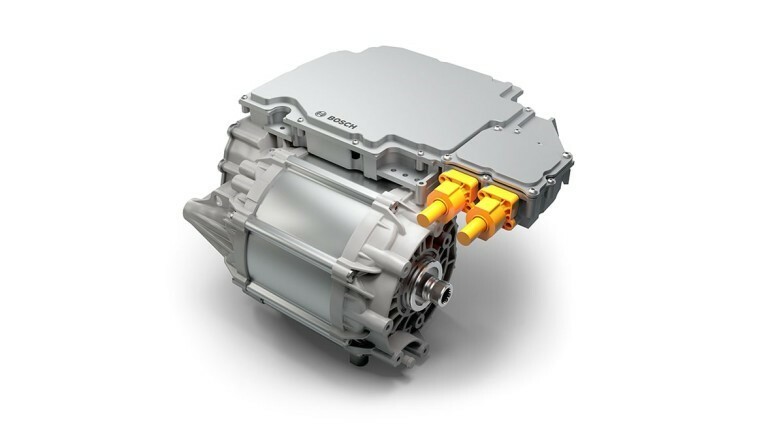 More information about the powertrain for electric vans can be found here. Stuttgart, Germany – Ordered with two clicks and conveniently delivered to your door the same day: the boom in online shopping is stretching delivery traffic in major cities to its limits. Vans and heavy trucks squeeze their way through city centers, where a lack of loading zones often leads them to double park. The result: blocked roads, noise, and emissions. In cities around the world, this is also causing traffic jams and fueling discussions about driving bans. And it’s not just delivery services that are affected, but also tradespeople and other small companies that make customer visits in vans. 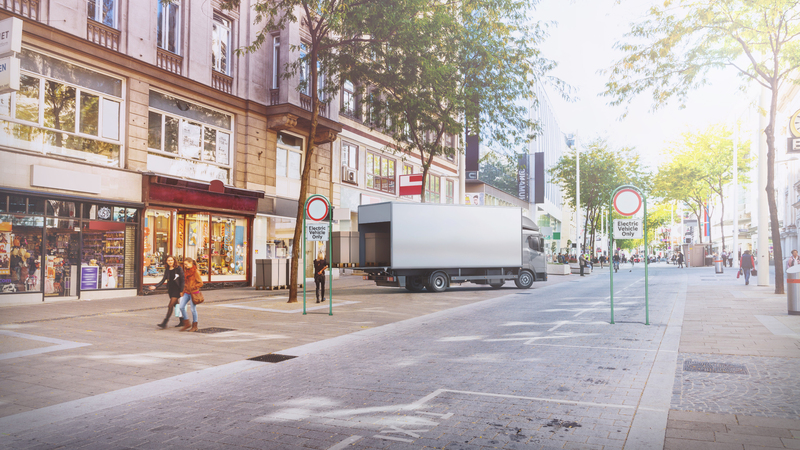 “To keep pace with goods supply in cities, there’s no avoiding a rethink of delivery traffic,” says Dr. Markus Heyn, member of the board of management of Robert Bosch GmbH. This is one objective Bosch is looking to fulfill with its new electric powertrain for light commercial vehicles. The first vehicles to have this under the hood will launch in 2019. Bosch is bringing e-mobility to where it really makes sense – urban deliveries. Deutsche Post has already initiated change in urban deliveries with its StreetScooter, which uses a Bosch drive system. Now Bosch is going a step further by launching an electrical powertrain suitable for the vast majority of delivery vehicles. 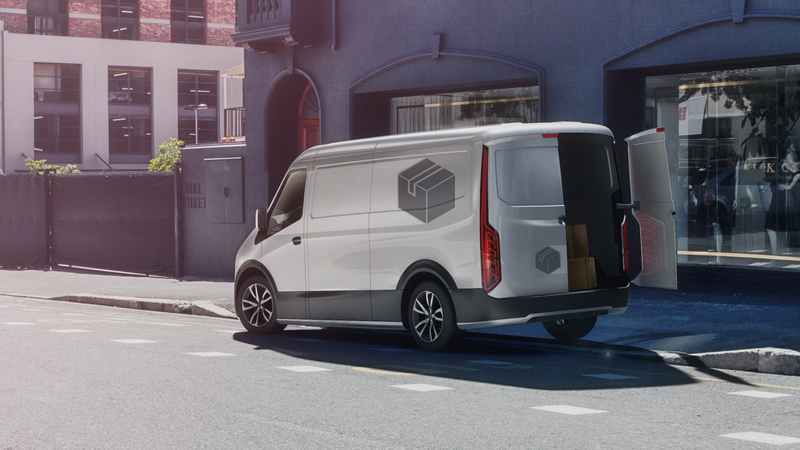 The idea behind this electromobility campaign is for electric vans to handle last-mile deliveries from distribution centers to recipients. The kind of stop-and-go traffic this entails is one area in which electric vehicles are particularly efficient, because they can recuperate the energy from constant braking, which increases their range. Most delivery routes amount to less than 80 kilometers a day – a distance easily covered on a single battery charge. Fleets can then be recharged overnight at the depot. Any driving bans in city centers would not affect electric fleets, since their powertrains cause zero local emissions. And it’s not just cities that are keen to see package and courier services make resource-sparing deliveries. 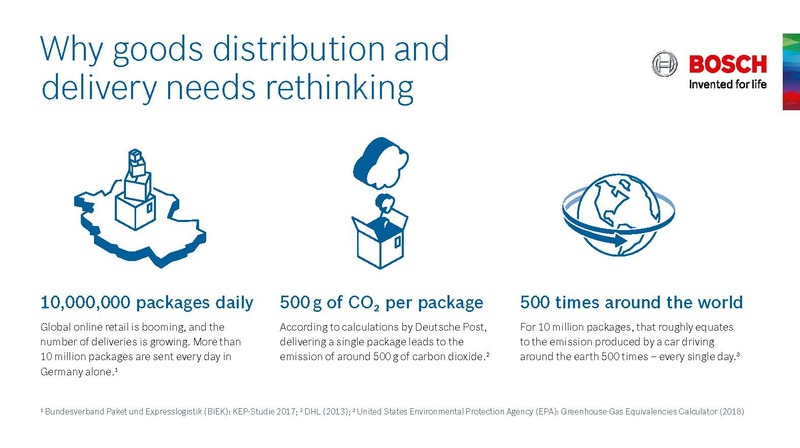 For 61 percent of Germans, whether an online retailer makes deliveries with electric vehicles is a key criterion in their choice (source PwC). One further advantage is that electric vehicles make less noise, which should also increase people’s willingness to accept deliveries later into the evening. This could relieve traffic at peak times and provide for more flexible delivery windows. “Bosch is bringing e-mobility to where it really makes sense – urban deliveries,” Heyn says. 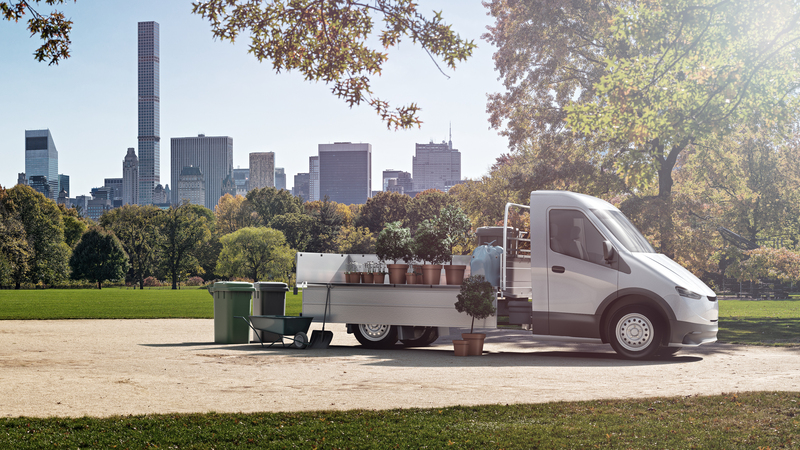 There are two versions of Bosch’s eCityTruck powertrain: one with a transmission and one without. The goal is to create solutions that are quick to integrate and accommodate automakers’ differing requirements. 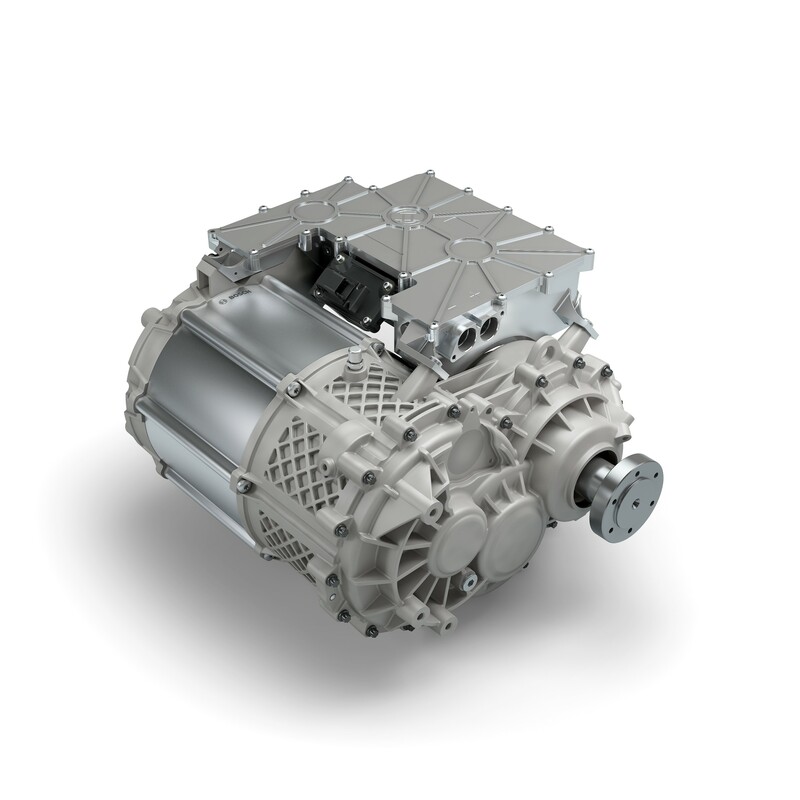 These powertrain solutions can be scaled for light commercial vehicles weighing two to 7.5 metric tons, making them suitable for a large section of the commercial vehicle market. How? Small vans are very common; approximately three-fourths of all commercial vehicles registered in Germany belong to this class, and that number is on the rise (source: Shell). “Bosch’s electrical powertrain for commercial vehicles has the potential to change the face of urban delivery traffic. We’re getting electric vans ready for the mass market,” Heyn says. With its new eCityTruck powertrain concept, Bosch has taken multiple components such as an electric motor and power electronics and combined them into one unit. 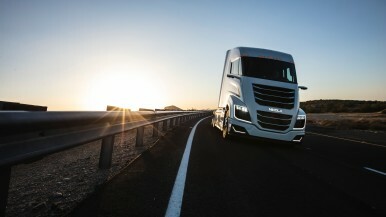 This economizes on parts, making the powertrain not only far more efficient, but more affordable as well. 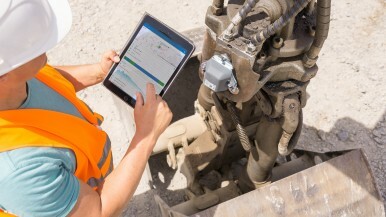 Thanks to the easily integrated solution, customers no longer have the time-consuming task of developing new components. One further advantage for automakers, both established names and new players, is that the Bosch solution lets them bring vehicles to market quickly. 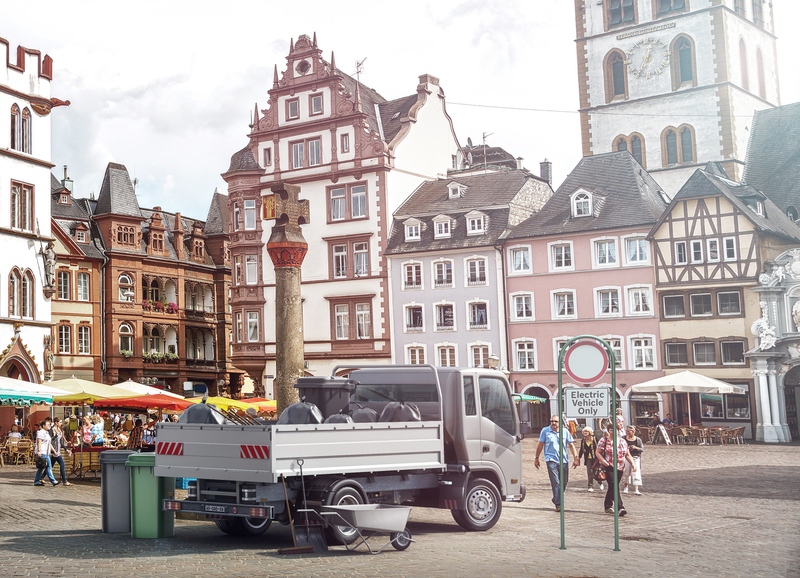 Bosch’s electrical powertrain for commercial vehicles has the potential to change the face of urban delivery traffic. We’re getting electric vans ready for the mass market. Bosch already offers an all-in-one solution for passenger cars – the e-axle – which significantly shortens vehicle development times. By expanding its product portfolio to include light commercial vehicles, Bosch is taking another decisive step in supporting automakers with their electrification strategies. 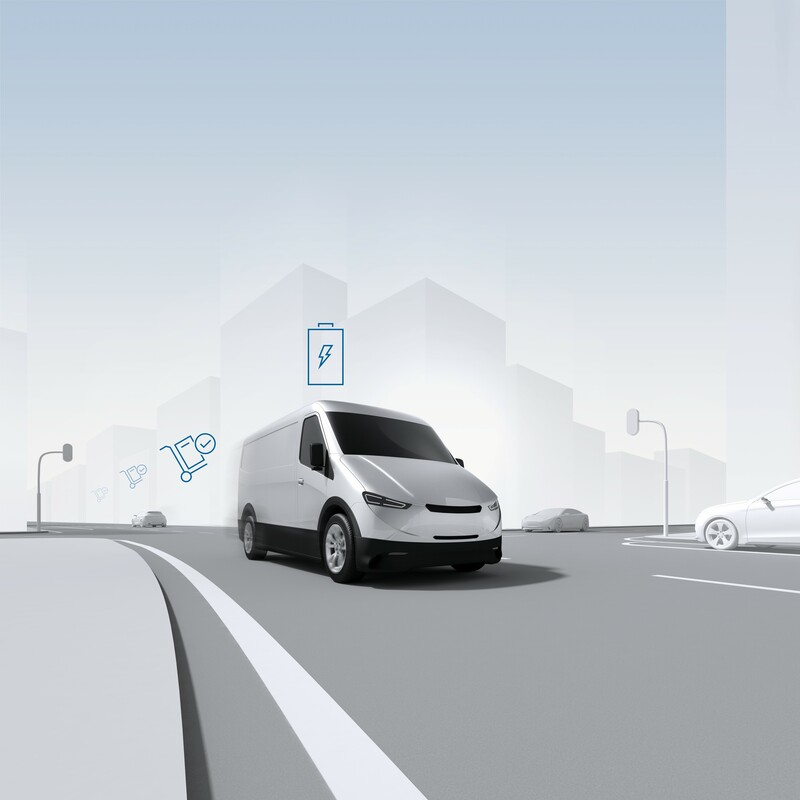 Bosch’s plans for the electrification of commercial vehicles go beyond vans. Together with the Nikola Motor Company, a U.S. start-up, Bosch is developing a powertrain that raises the bar for electric range. For Bosch, these powertrain technologies for delivery traffic are another milestone on the path toward achieving a leading global position in the electromobility mass market set to emerge after 2020, and toward making its vision of emissions-free, accident-free, and stress-free mobility a reality. Bosch sees the future of mobility as automated, connected, and electrified. More information about the electrical powertrain for commercial vehicles can be found in the relevant web special.